Missy Blue my jack russell and I will be at Queens Park Library 666 Harrow Road, London W10 4NE on 29th October at 4pm to celebrate an early HALLOWEEN 'trick or treats'. Kids from 5 upwards and their parents will be invited to a 'talk' and 'meet and greet' Missy Blue at the local library - no tricks just treats!!! I will be talking about Taking care of our pets during festivities - keeping our pets safe and being responsible with the way we act around other peoples pets. Cats are often seen roaming around during Halloween and even though it is not the official time of fireworks - they are still being set off and are frightening to our pets. Dogs should be walked earlier as every year rescues are bombarded with calls of missing cats, or dogs that have run off - in fright. Also when kids are trick or treating for their safety they should be accompanied by a suitable adult and not left to go out on their own NO MATTER how early in the evening it could be. I have worked with rescue dogs since 1997 - with all dog breeds - my passion is Dogs and learning more and more about how their body language and how OUR own reaction to their behaviour is so important to 'get right'! Diet is also important - a bad diet full of colorants could make your dog hyperactive or not enough fiber could lead to the need to the tendency to eat tissues, newspapers etc . Socialising a pup from an early age is so important - not only with other dogs (after all vaccinations are upto date) but with different sounds. Giving them a rountine and boundaries and start how you mean to go on - when the pup is small and cute - IF you let them on the sofas - beds etc and then when they get bigger YOU decide that IT was not such a good idea - suddenly they ARE told NO - confusion sets in and thats when you wonder why they start showing teeth and signs of dominance - or - aggression. Remember all dogs need a 'reward' to focus on during training - this could be food - or a ball - or toy - something that your dog can be motivated by that will stimulate them to 'react' positively to training. It is so important before you decide to get a puppy - to look into the breed that will suit your lifestyle and also that your lifestyle will include and be 'right' for your pup. Your home environment - is it suitable for a large dog or more suitable for a small dog. Your working hours - is someone home during the day - who will look after the dog when you go away - or when you are at work. The mental and physical stimulation the dog breed you choose will need. Just because your dog is a jack russell or another small dog - they will still need lots of exercise - a whippet or greyhound though they need exercise - do like their home comforts and are often seen to be 'doggy couch potatoes'!! Of course if you do decide to get a puppy - make sure you see the parents - and are able to visit the breeders - NEVER get a dog from a pet shop - often these pups come from backstreet breeders or puppy farms. Another dog class in South Westminster - a warm doggy welcome to Finn the whippet a new member to the class at St Georges Square SW1! Finn is just four months old and full of puppy bounce and 'lets play' - wearing his bright blue doggy coat he was more into playing with other dogs - then 'learning' dog socialising skills'. Bailey the lab puppy was glad of another 'new' playmate to chase and entice in the joys of a the 'puddles' in the Dog Area! Tank the other 'large' pup was rather aloof and was waiting for the training session to begin! 'Attention - please' - back on leads and lets stop that pulling - walking to heel - using the block as a non verbal command - stop - block - walk to heel - walking in canine 'pairs' - then practice the 'sit and stay'. Bailey's recall has improved but his walking on lead makes him anxious and his owner has asked if he can have a one on one at a later date. Bailey gets distressed while walking on the street at traffic - loud noises - and whines consistantly and needs individual training 'outside the dog area'. Another lady comes in to the park - without her dog - she had only just heard about the 'free dog classes funded by 'South Westminster Wards' and said she definitely was coming to the next one!! 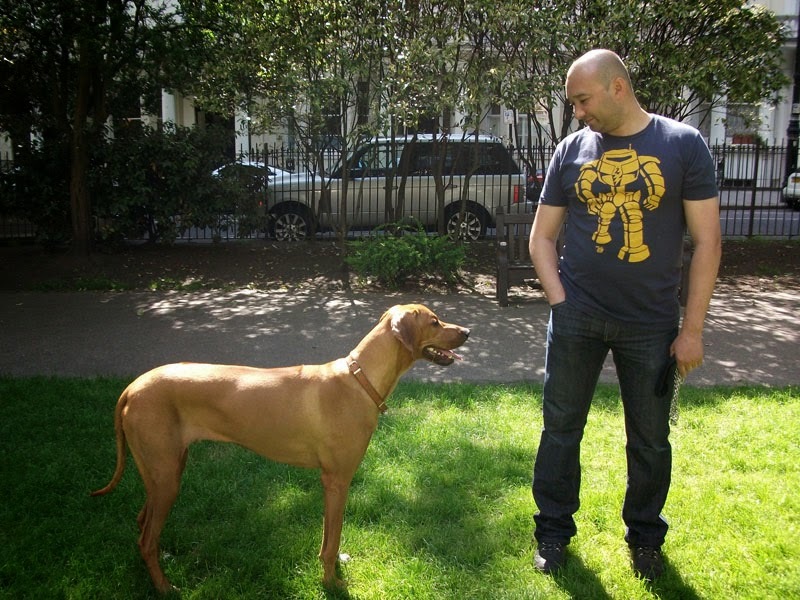 Last class until the spring is 28th October at 2pm at the 'Dog Area' St Georges Square SW1. 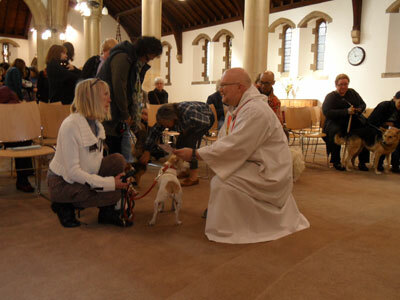 What a great way to celebrate World Animal Day, The Feast Day of Francis of Assisi. There was Pluta, Holly, BB, Mollie from Rumania, - big dogs - small dogs, cats (in their carriers) a rabbit and of course my two 'girls' Missy Blue and Chelsea Rose! Graham Noyce the Animal Loving Reverand led the service and holds this 'event' every year in his church where all animals are given a warm welcome. We sang - accompanied by our pets - who sounded a lot more in tune than we did!! We prayed for those that had blessed our lives but were no longer with us. We prayed for Urgent Homeless Dogs - The Poundies (Dogs on Death Row) Animals that had suffered and those ones we could not save from man's destruction. Missy Blue and Chelsea Rose being blessed and I asked for animal friends to be blessed in USA, Canada, Turkey and Worldwide.